BRUSSELS (AP) — The European Union expressed concern about Italy's debt levels Wednesday and warned the government in Rome to push through measures to shore up the public finances. OKLAHOMA CITY (AP) — One of the nation's top rating services is upgrading its economic outlook for Oklahoma City from negative to stable, citing the city's maintenance of a high level of reserves. Moody's Investors Service also recently affirmed the city's ratings for other financial metrics. DAVOS, Switzerland (AP) — As the world's financial and political elites convene here in the Swiss Alps for the World Economic Forum, their vision of ever-closer commercial and political ties is under attack — and the economic outlook is darkening. Britain's political system has been thrown into chaos as the country negotiates a messy divorce from the European Union. LONDON (AP) — Unemployment across the 19-country eurozone fell in November to a decade-low rate, official figures showed Wednesday, but worries over the economic outlook have stoked concerns it may not fall much lower, if at all. Eurostat, the European Union's statistics agency, said a 90,000 monthly fall in the number out of work to 13.04 million reduced the overall rate to 7.9 percent from the previous month's 8 percent. SINGAPORE (AP) — Asian markets were mixed Tuesday in narrow trading on doubts that U.S. and China can manage to resolve their festering trade dispute. BOULDER, Colo. (AP) — A recent report says the Colorado economy will continue to grow next year, but perhaps at a slower pace. The Daily Camera reports the 2019 Colorado Business Economic Outlook Forecast shows that Colorado, despite slower growth, will still be in the top 10 states next year for employment growth. BISMARK, N.D. (AP) — A North Dakota economist expects the projected economic recession to be both good and bad news for the state's next two-year budget cycle. SINGAPORE (AP) — Global stock markets fell Tuesday after the International Monetary Fund lowered its outlook for the world economy, citing the impact of rising interest rates and trade tensions. KEEPING SCORE: Germany's DAX lost 0.5 percent to 11,891 while the CAC 40 in France shed 0.3 percent 5283. Britain's FTSE 100 dropped 0.4 percent to 7,201. Wall Street was set for a drop. Dow futures lost 0.5 percent and the S&P 500 futures were down 0.6 percent. SINGAPORE (AP) — Asian markets are mixed after the IMF downgraded its economic outlook, citing rising interest rates and mounting tensions over trade. OKLAHOMA CITY (AP) — One of the nation's top rating agencies is revising Oklahoma's economic outlook from negative to stable, citing a stabilization of the state's finances as a result of revenue growth. Moody's Investors Service announced on Thursday that it was affirming the state's Aa2 rating, the agency's third highest rating. The switch from a negative to stable outlook suggests more financial stability and the agency's belief the rating will remain unchanged for at least a year. BANGKOK (AP) — Trade conflicts, rising debt and the potential impact from rising interest rates in the U.S. will likely dampen growth in the coming year, the Asian Development Bank said Wednesday in an update of its regional economic outlook report. The Manila, Philippines-based regional lender said Wednesday that it expects economic growth in Asia to remain at a robust 6.0 percent in 2018 but to slip to 5.8 percent next year. LONDON (AP) — The Bank of England has kept its main interest rate on hold at 0.75 percent as policymakers await developments in Britain's looming exit from the European Union. In a statement Thursday, the bank said its nine-member rate-setting panel voted unanimously to keep borrowing rates unchanged, a month after sanctioning a quarter-point increase. The Commerce Department said Monday that sales at retailers and restaurants increased 0.5 percent in June, following a big 1.3 percent gain the previous month. May's figure was revised sharply higher from an initial estimate of 0.8 percent. BEVERLY HILLS, Calif. (AP) — Top Republican and Democratic leaders of the House and Senate offered starkly different assessments Monday of the nation's political and economic outlook at a global conference ahead of the midterm election. WASHINGTON (AP) — Treasury Secretary Steven Mnuchin expressed cautious optimism Saturday over efforts to resolve trade tensions that have rattled financial markets and clouded the global economic outlook. Mnuchin held a string of meetings over the past three days with financial officials from China, Japan and Europe over the punitive tariffs the administration has unveiled in an effort to fulfill President Donald Trump's campaign promise to reduce America's huge trade deficits. 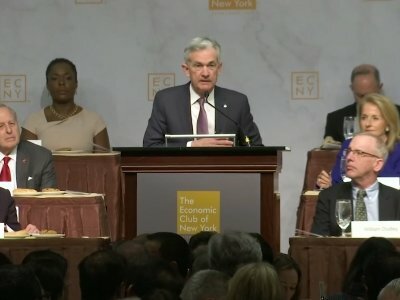 The Fed reported Wednesday that the economic outlook remains positive with growth continuing at a moderate pace in the central bank's 12 regions. WASHINGTON (AP) — The International Monetary Fund has upgraded its economic outlook for the United States in 2018 and foresees a strong year for the global economy as well. But its chief economist warns that the prospect of an escalating trade conflict "threatens to undermine confidence and derail global growth prematurely." FRANKFURT, Germany (AP) — Fears about international trade disputes and the conflict in Syria have sent the economic outlook lower among investment professionals in Germany, the largest economy in the 19-country euro currency union. PROVIDENCE, R.I. (AP) — Democratic Gov. Gina Raimondo is meeting with business and community leaders to discuss the state's economy and ways to develop it. Santander Bank and the Greater Providence Chamber of Commerce will host their 18th annual Economic Outlook Breakfast for the business community on Wednesday morning at the Omni Providence Hotel. Raimondo plans to give welcoming remarks. A panel of local business and community leaders will discuss issues and challenges facing the state. LONDON (AP) — Global stock markets were little changed Tuesday ahead of the new Federal Reserve chair's testimony to Congress later. Given that Jerome Powell has yet to chair a policymaking meeting, anything he says on the U.S. economic outlook and the likely path of U.S. interest rate could stir markets out of their current torpor. BEIJING (AP) — Asian stocks rose Monday after Wall Street rallied as investors looked ahead to the U.S. Federal Reserve chairman's congressional testimony this week for insights into its economic outlook. Lake Houston area businesses and professionals got a taste of what to expect from the 2018 economy during the Economic Outlook Luncheon at the Walden Country Club in Atascocita on Feb. 22. The event, which was hosted by the Lake Houston Area Chamber of Commerce, featured local and national experts who projected micro and macro versions of the economy based on what happened in 2017. Local business owners will get the opportunity to learn how macro and micro trends will effect the Lake Houston area in 2018 during the Economic Outlook Luncheon this week. The event, which will be hosted by the Lake Houston Area Chamber of Commerce, features a local and a national expert who will profile and project economic trends and indicators, Chamber President and CEO Jenna Armstrong said. OMAHA, Neb. (AP) — A monthly survey of rural bankers in 10 Plains and Western states suggests an improved economic outlook. A report released Thursday says the Rural Mainstreet Index rose to its highest reading since May 2014, reaching 54.8 in February. January's figure was 46.8, and December's was 47.8. Survey organizers say any score below 50 suggests a shrinking economy in the months ahead. DeKALB – The DeKalb County Economic Development Corp. has announced its annual Economic Outlook Luncheon. Bill Strauss, senior economist for the Federal Reserve Bank of Chicago, will be the guest at the March 22 event. He will provide an update on the state of the economy, provide a forecast for the future and assess previous predictions. BOISE, Idaho (AP) — Idaho lawmakers on an economic outlook committee are predicting that the state will see roughly $3.8 billion in tax revenue in the 2019 fiscal year — a more than 5 percent increase from the previous year, mirroring Gov. C.L. "Butch" Otter's revenue projections for the sixth year in a row. Detroit — A group of experts will address the current state of Michigan's economy and the importance of becoming an autonomous vehicle epicenter during an event Thursday sponsored by the Detroit Economic Club. The Michigan Economic Outlook meeting at MotorCity Casino Hotel will include a panel discussion with Jeff Mason, CEO of the Michigan Economic Development Corp. and Ellen Hughes-Cromwick, interim associate director and senior economist at the University of Michigan Energy Institute. Nearly nine years into the economic expansion that helped lift Detroit from its metaphorical knees, Michigan's economy continues to look up. The state's economic outlook is at a six-year high, according to the annual Michigan Economic Outlook Survey prepared by the Ann Arbor-based Baker Strategy Group and to be presented Thursday at the Detroit Economic Club. More than 80 percent of Michigan business leaders would recommend the state as a "great place" to grow business. The Greater Heights Area Chamber of Commerce will feature Bill Gilmer at its Jan. 25 Economic Forecast Luncheon. The luncheon will be 11 a.m.-1:30 p.m. at the Sheraton Houston Brookhollow Hotel, 3000 North Loop West, Houston. Gilmer, a professor of economics at the University of Houston, is considered one of the nation's leading economists about the economic outlook for Houston, Texas and, the country and the world. He will discuss business, employment, interest rates, energy and real estate. WASHINGTON (AP) — U.S. companies closed out 2017 with strong hiring in December, adding the most jobs in nine months. Payroll processor ADP says that businesses added 250,000 jobs last month, up from 185,000 in November. The gains were led by robust hiring in health care, professional services such as accounting and engineering, and retail. WASHINGTON -- A year ago, with the election of a U.S. president who had fulminated against the international trade and financial systems, some analysts worried that the engine of global prosperity might soon be sputtering. But that's not what happened. Gov. Mark Dayton says a projected budget shortfall will require some "modest corrections" to the Legislature's budget passed earlier this year. An economic forecast released Tuesday shows a $188 million shortfall at the end of the current two-year budget cycle. But that sum could change drastically with a tax bill and other measures winding through Congress. WASHINGTON (AP) — U.S. economic growth has accelerated after a sluggish start to the year, while unemployment has fallen to the lowest point in almost 17 years and the stock market has been climbing to record highs. President Donald Trump attributes the good news to optimism about his economic program but some economists worry about how long the good times can last. BOSTON -- While housing and immigration trends loom as obstacles, the Massachusetts economy is poised to experience low unemployment rates in the coming years although job growth is expected to slow in the face of labor force constraints, according to a newly released economic outlook. WASHINGTON (AP) — Federal Reserve Chair Janet Yellen will update Congress on her economic outlook Wednesday and possibly weigh in on the mystery of why inflation has remained persistently below the Fed's target rate. NEW YORK (AP) — Hurricane Maria has thrown Puerto Rico's already messy economic recovery plans into disarray.